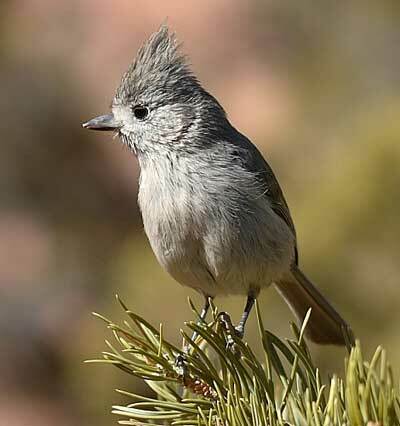 Adult Juniper Titmouse. Photo by Tony Randell, Wikimedia Commons. Click for full resolution version. A Juniper Titmouse (Baeolophus ridgwayi) nest. Photo taken in Coaldale, CO by Zell Lundberg. The fur is provided by local dogs. Another Juniper Titmouse nest. Photo by Zell Lundberg of Coaldale, CO, taken 5/4/08. 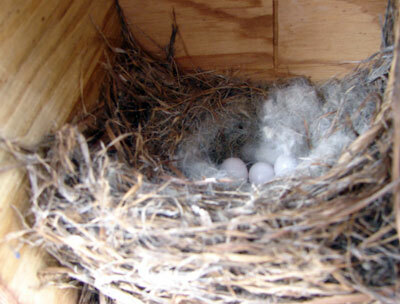 Even though the female was incubating the eggs, she still had a layer of animal hair for extra insulation. 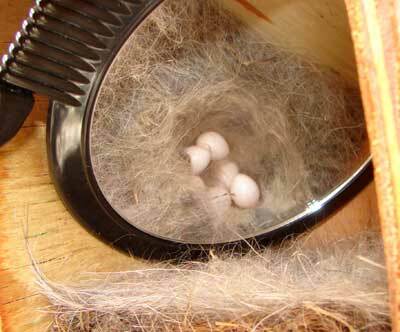 This nest has 6 eggs. See Bio. Egg Description: 3-9 short subellipitcal to elliptical, white, may be faintly marked with tiny speckling of pale reddish brown, evenly scattered to scattered very sparingly, smooth and nonglossy or slightly glossy. 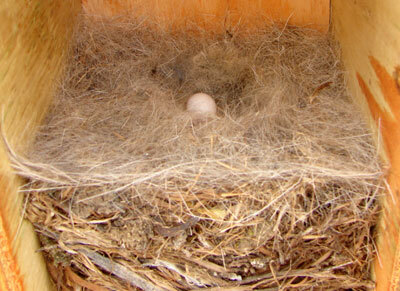 Juniper Titmouse nest with egg. Photo by Zell Lundberg. 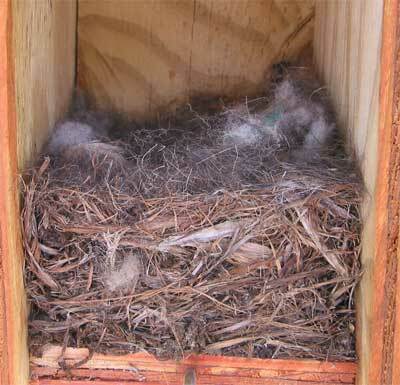 Incubating/brooding female is often reluctant to flush when the box is monitored. May leave when door is opened and scold monitor from nearby tree. Left: Juniper Titmouse eggs (six) Notice how deep the small nest cup is. 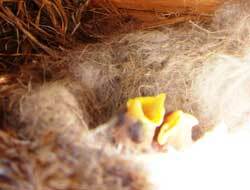 Below: Nestlings, probably about 2 days old. Photos by Zell Lundberg. Juniper Titmouse incubating eggs. Notice spray of fine feathes at the scapulars that may be part of breeding plumage. 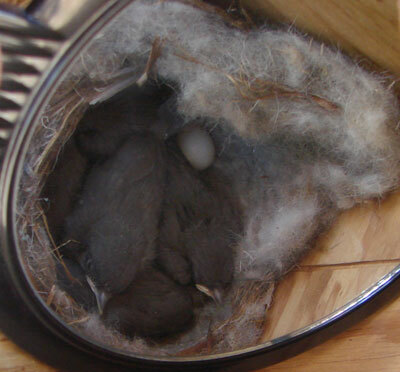 Also notice how the "warm-weather" nest differs from the early srping nest with significantly less insulation (animal hair). Photo by Zell Lundberg. 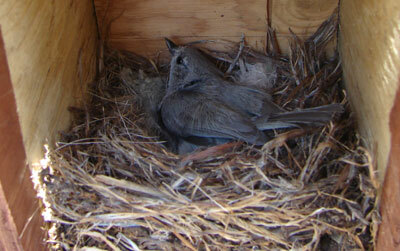 3-4 day old Juniper Titmice. Both parents were in the box when it was opened. They were probably feeding, as one chick (lower right) has an insect still in it's mouth. Photo by Zell Lundberg. 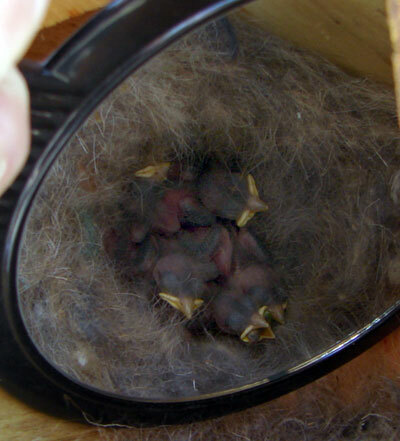 JUTI nestlings, maybe 5-6 days old. Photo by Zell Lundberg. Photo by Zell Lundberg. 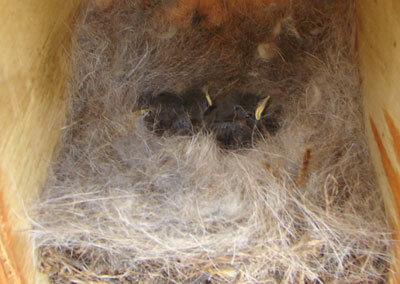 These nestlings are about 10-11 days old, in a sea of dog hair. 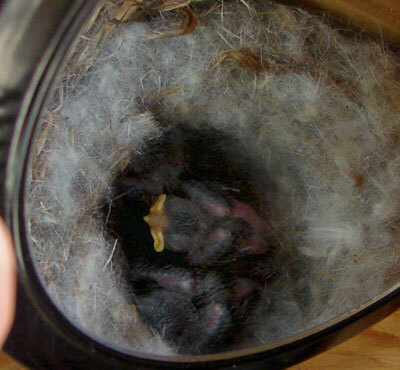 JUTI nestlings, about 15 days old. Photo by Zell Lundberg. One unhatched eggs egg appears in the photo.